Could your posture use a serious improvement, and do you want to know whether to trust Aligmed or Intelliskin with that job? Because in this Alignmed Vs Intelliskin comparative review I will be taking a close look at these two companies and their products. Experts agree that poor posture is a problem on an epidemic scale! The major culprit is the time we spend looking at computer screens, televisions, smartphones or doing activities like driving a car. Over time our bodies adapt and poor posture develops giving rise to many issues like achy and stiff muscles or even pain in the back, neck, and shoulders. Especially back pain is a big problem and according to the American Posture Institute, 80 % of all Americans report having back pain at some point in their life. Luckily, there are different products that potentially could make a big difference for you, and you can read more about their pros and cons here. Both Alignmed and Intelliskin are companies that have been able to differentiate themselves due to their high-quality products and commitment to using good science and clinical testing. The shirts by alignmed come in black, white and with and without a zipper. There is also one in white and grey but doesn’t have a zipper version. The shirts are sometimes referred to with a 2.0 on Amazon. The Posture shirts come in versions for men and women, each specifically designed to fit the posture requirements of the appropriate gender. All of the clothing in the Alignmed product line use the technology called “neurobands” which upon wearing signals your muscles to align properly by lengthening or contracting. The Alignmed Posture Shirt (2.0) for Men is a combination of spandex (which makes up 17% of the total material) and polyester (making for the other 83%). The material is also packed with the unique neurobands, ventilating “Power mesh panels”, anti-microbial protection and moisture-wicking, all of which will help ensure that you feel as comfortable as possible while wearing the shirt. Its unique design stimulates your muscles and joints to align in a good manner. This among others improve the mechanics of your shoulder reducing the wear and tear and it helps to activate your core. 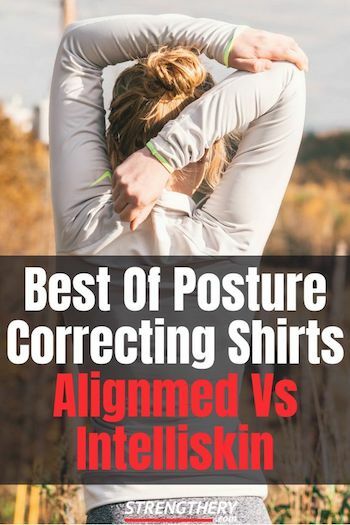 However, apart from the fact that this shirt is actually able to help correct certain posture issues, its compression effects also stimulates blood flow enhancing recovery and potentially make you function better in your day-to-day activities. Learn more about the zipper version on Amazon. Note that there is also a non-zipper version. Some people report that the men’s shirt gets warm and that wearing something on top of it would be too much on a warm day. This does not seem to be a problem with the women’s version. The shirt you see in the image below is the women’s zipper shirt. The image is from Alignmed’s Instagram profile. Made to fit the body specifications of women, the fabric is constructed in the same manner as the men’s version – a combination of 83% polyester and 17% spandex. Just as it is with the men’s version, this shirt also comes with neurobands, moisture wicking, anti-microbial protection and vented Powermesh panels that help enhance comfort and your ability to stay upright for even longer. All in all, the benefits you can get from this shirt include improved core activation, enhanced shoulder mechanics, proper body alignment and reduced pain in the back and shoulders, among others. Check out what other people have to say about the zipper version on Amazon. Note that there is also a non-zipper version. Intelliskin has a wider product line than Alignmed and also have different variations of shirts. They come in long-sleeved, short-sleeved and tank-tops. They also come in stylish color themes and have a zipper version. The foundation series have the most “aggressive” posture correction. The shirts use a patented technology that the company has called PostureCue™. Basically, this technology mimics kinesio taping which is one of Dr. Brown’s fields of expertise. The PosterCue stimulates the muscles to lengthen or contract to align your body and help you maintain good posture. The Men’s Foundation Tee is made from a combination of elastane and Italian nylon, both of which provide an incredibly lightweight and the comfortable compression. The fabric of the shirt actually has some major engineering in it as well. It is ventilated, anti-microbial, moisture-wicking and of course comes with the patented PostureCue technology. The smart compression technology will be able to help strengthen your core muscles, improve shoulders movement and adjust your posture. Works well for everyday use and while exercising. Get more information and learn what other people have to say about it on Amazon. Check out the foundation tee in the video below. The Women’s Foundation Short Sleeve Tee is also great for any form of activity and could help boost athletic performance. With moisture wicking, anti-microbial properties, and anti-odor features, you can rest assured that you will stay fresh all day long when you put this shirt on. The shirt is also fitted with 4-way stretch, hypoallergenic silicone arm cuffs, and mesh paneling, all of which provide breathability and posture support with every step you take. With this shirt, you get corrected posture, strength and durability, a breathable fabric, and freshness for as long as you have it on. Check out this posture shirt on Amazon here. Posture correcting shirts can unlike posture braces be worn seamless in your daily life and you won’t have to worry about concealing an ugly brace. You also won’t have to worry about scratching and irritating sensitive skin. A posture shirt can be worn by itself or you can put something on top. You could argue that you don’t have to cover up the shirt because it looks rather cool (at least I think so). Posture correcting shirts have another unique benefit over posture braces. Essentially a posture brace will force muscles and joints to align which on long-term has the potential to make your muscles weaker because the brace is doing most of the work and not your muscles. You can read more about this here. Posture shirts, on the other hand, stimulate your muscles to do the work. However, posture correcting shirts do come at a much higher price than a posture brace. If the price is a concern, I suggest you check out this buyer’s guide I wrote on some small and light-weight posture braces that are easier to conceal. Should You Chose Alignmed Or Intelliskin? It turns out, that both companies sell great products. Both use an evidence-based approach and uses feedback and advice from many professionals to continuously improve upon their products. Although they call their posture correcting technology distinct names: “neurbands” and “PostureCue” and attribute the function to different concepts, I am personally not sure that there is any significant difference. Both technologies do exactly the same i.e. correct your posture. Both companies sell their products conveniently on Amazon, have great customer support and return policy. The pricing is similar, but overall the products from Intelliskin are usually a bit more expensive. With all that in mind, I think you should simply choose the posture shirt you think looks the best. Whether you chose Alignmed or Intelliskin, I am sure you can experience great results. Improve ergonomics in general. It would make a lot of sense to focus on where you spend the time most, e.g. your desk, your bed (many people disregard this), your car or just sitting in general. Improve “postural awareness” – Become familiar with what good posture looks and feels like. Wearing a posture shirt is great for this. Click here to read 7 more good reasons to wear a posture corrector. If you are still on the fence here is a little bit of background information on the companies. Sometimes it can be useful to add a bit of context when making a decision. After all, we are talking about products that are sold at a premium price. Alignmed goes all the way back to April 2001 when it was established by Bill Schultz. At that time Bill was working as an executive in the orthopedic surgical equipment industry and had spent many years there. Already in his 30s, he began to experience pain in his lower back and it worsened over time. His doctors recommended a spinal fusion surgery, but Bill was hesitant. This kind of surgery is a very serious one that doesn’t come without its risks and Bill decided he wanted to find an alternative. It was when he put on a device recommended by a chiropractor which relieved his pain that he knew he was onto something. He purchased the patent for this device and invested in further research and development. This was the start of his evidence-based apparel approach and how Alignmed was born. If you are interested in reading more about the background of Alignmed there is an interesting interview on the official website. Intelliskin has also been around for a long time. The founder Dr. Tim Brown is a chiropractor in sports medicine and has top positions in the Association of Volleyball Professionals and the Association of Surfing Professionals, Northern Hemisphere. Brown is also well-known for his expertise in kinesio taping. As the demand for his taping skills kept increasing he decided to find a solution for how he could essentially help more people. What he did was incorporating the kinesio taping concept into a garment. He used several years on working and testing with professional athletes and continuously improved the design. After several iterations, the Intelliskin shirts were eventually born. From that brief background description both seem to be great companies clearly with the intention of helping other people. Actually, the companies have many similarities and funnily enough, both are located in Newport Beach, California. They are not associated, although I did see once mentioned that they had a short discussion about potential cooperation many years ago. In short, both companies sell premium posture correcting clothing that is backed by a lot of research and development and continuously improved upon. The improvements are based on testing and taking feedback from a large number of athletes, chiropractors, physiotherapists, and other medical professionals. Of their different products, the most popular is the posture shirts and they work great to align your upper body posture. Theragun Vs Jigsaw – Is The DIY solution comparable?